The School of Medicine held its 28th Annual Postgraduate Research Student Symposium on Friday 8th June, 2018, at Ninewells Hospital. 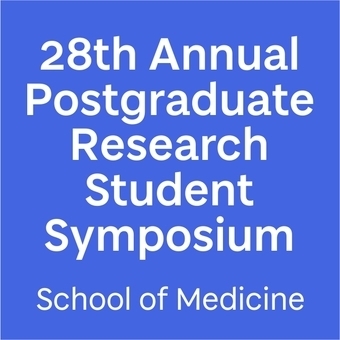 The Symposium gives students the opportunity to present their research, develop their presentation skills, learn about other areas of research and network with students and supervisors within the School. The Symposium consisted of oral and poster presentations with lunch and refreshments. The day concluded with a drinks reception and prize giving. Abdullah Alzahrani, a PhD student studying at the Institute of Motion Analysis & Research (IMAR) at the TORT Centre won 2nd Prize in the category of Dry-lab/non-lab Poster. His scientific research poster was titled “The biomechanical assessment of balance and gait for stroke patients and the implications in the diagnosis and rehabilitation” and is co-supervised by Dr Weijie Wang and Dr Graham Arnold. Left: Abdullah presenting his poster to the judges; Bijad with poster judges Dr Suzie Schofield and Dr Linda Jones. Also presenting posters were Rayan Jastania, and Bijad Alqahtani from the TORT Centre. Rayan’s PhD research, entitled “Development of electromyography controlled assistive device for patients with movement disability in the lower limbs and its application in rehabilitation” is co-supervised by Dr Weijie Wang and Dr Tim Drew. Bijad’s PhD research, entitled “The biomechanical assessment of tai chi chuan movement and implication in rehabilitation exercise” is co-supervised by Dr Weijie Wang and Dr Graham Arnold. Terry Melaugh, an Intercalated BMSc graduate from 2016-2017, won 2nd Prize in the category of 1st year postgraduate research wet-lab/dry-lab Presentations. Terry is undertaking the dual MBChB/MSc degree and he orally presented his research on “Investigating lower limb biomechanics in Gaelic football and soccer: a comparative study”, which is co-supervised by Professor Rami Abboud and Dr Graham Arnold. Terry studied a BMSc in Applied Orthopaedic Technology at the TORT Centre where his research was titled “Which moonboot is more effective? A comparative study of two similar structural moonboots” which was supervised by Professor Rami Abboud. Another student also orally presenting was Nawaf Al Khashram, whose PhD research, entitled “Clinical gait analysis of patients with cerebral palsy using musculoskeletal computer modelling techniques” is co-supervised by Dr Weijie Wang and Dr Graham Arnold. Left: Nawaf Al Khashram, Abdullah Alzahrani, Bijad Alqahtani and Rayan Jastania; Right: Abdullah with his Poster Award. “Congratulations to Abdullah and Terry for winning awards and well done to everybody who presented their research at this year’s Symposium. It’s always extremely rewarding to hear of current and previous students’ achievements, especially when their success is compared with their peers. We’re extremely proud of our students' success rate of presenting podium and poster presentations at conferences over the years.